Don't let these simple looking weapons fool you. They're made from the world's strongest Applied Phlebotinum, and could crush a tank. Afrofuturism is an artistic genre that melds Speculative Fiction with the cultures and experiences of Black people around the globenote As Wikipedia puts it: "A cultural aesthetic, philosophy of science, and philosophy of history that combines elements of science fiction, historical fiction, fantasy, Afrocentrism , and magic realism with non-Western cosmologies in order to critique not only the present-day dilemmas of black people, but also to revise, interrogate, and re-examine the historical events of the past... Afrofuturism addresses themes and concerns of the African diaspora through a technoculture and science fiction lens, encompassing a range of media and artists with a shared interest in envisioning black futures that stem from Afrodiasporic experiences.". While black artists have been writing science fiction since the 1860snote Martin R. Delaney's Blake, or the Huts of America , an Alternate History novel about an attempted slave insurrection in the antebellum South, was published in 1859, the concept and term were coined in the early 1990s by Mark Dery's essay/interview series "Black to the Future" , which contrasted the seeming lack of African-American science fiction writers with the preponderance of sci-fi/fantasy elements found in the work of other African-American musicians and artists at the time. A key point of Dery's essay (and a driving force behind much Afrofuturistic work) is the amount of overlap between sci-fi tropes and African-American history — as an example, he cites the similarity between African slaves and alien abductees: captured by unknown and incomprehensible beings with advanced technology, shipped to a strange and alien world for sinister purposes, and frequently subjected to horrific medical abuse. Another common aspect of Afrofuturism is deliberate pushback against the lack of black (or at least non-white) characters in science fiction, and stereotypes of Africa as a primitive third-world nation and its people as savages or poverty-stricken waifs who can't grasp superior Western technology. Incidentally, YMMV on the current plausibility of this trope....but the keyword there may be "current". Given Africa's ridiculously large preponderance of people(the second largest continent after Asia in this regard), equally large preponderance of natural resources, and very long crop growing seasons on most of the continent...a great many international observers feel that as Africa increasingly outgrows its post-colonial strife and increasingly gets its hunger and disease issues under control, and as China and India settle into existence as First World nations....Africa is probably the "Next Big Thing" in the global economy by the middle decades of the 21st Century. China's ever-increasing investments therenote Admittedly done at least as much to increase Chinese political influence on the continent as for economic purposes; China is a vastly preferred investment source by Africans because A: It doesn't have the racist and imperialist legacy of the West in Africa, and B: It's rich. will probably accelerate this process. While most Afrofuturist art tends to be retroactively labelled as such, an increasing number of contemporary creators have consciously adopted the genre, and now incorporate it into their work. For speculative fiction that explores topics related to other marginalised groups, see Feminist Fantasy and Speculative Fiction LGBT. When adding examples, bear in mind this trope is not simply "black people IN SPACE!" It refers to science fiction and fantasy that specifically draws on the aesthetics and history of African and black cultures. Black Panther is probably the first example that comes to mind in discussions of Afrofuturism. Thanks to the amazing capabilities of the metal vibranium, the African nation of Wakanda is the most technologically advanced society on Marvel Earth. Dwayne McDuffie's early work with DC imprint Milestone Media was centered around creating minority heroes, many with a sci-fi bent. One of his creations, Static Shock, became popular enough to star in his own award-winning TV show. Elephantmen: The eponymous Elephantmen were created and trained by MAPPO at a huge lab/base somewhere in Northern Africa. The Pan-African Judges comics set in the Judge Dredd universe. Concrete Park features a cast comprised of Earth's outcasts (coincidentally all black or brown ethnic people), exiled to a distant desert planet and forgotten, left to their own devices. Cold Equator, the third and final book of the Nikopol Trilogy at least vaguely skirts this trope. Enki Bilal clearly put a lot of love into the eponymous futuristic climate-controlled arcology's fascinating blend of traditional African design and fantastic technology but he just can't resist the temptation to throw in tons of wacky ethnic stereotypes (not that the earlier volumes were much kinder to Europeans, mind you). 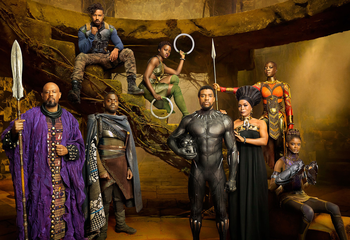 Black Panther (2018) leans heavily into this trope, with the central conflict centered on how involved the technologically advanced African nation of Wakanda should become in the affairs of the world, more specifically the affairs of the Black Diaspora. Space Is the Place: A film starring Sun Ra (see his personal example below), who attempts to relocate African-Americans to a new planet. The film has been said to be a response to the Black Panther Party, represented by the Overseer. Blade: A science-fiction-fantasy superhero movie starring an African-American hero, it also references Afro-American syncretic religions such as Santeria. Get Out: A blend of science fiction and horror which satirizes modern-day racism in the United States. Bright Bright uses the metaphor of various fantasy races to discuss present racial tensions and issues (Orcs are the lowest class of citizens, elves control much of the cities' economic and political power) while one of the main characters is a black police officer paired with the first Orc cop. John Sayles' The Brother From Another Planet, about a mute black-passing Human Alien named "the Brother" wandering the black communities of New York City in The '80s and running from the (white) Men in Black. Most of Sorry to Bother You's primary cast is made of black actors and the film mixes science fiction and surreal comedy. Africa Paradis, released in 2007, is a Beninese-French co-production set in 2033, about a United States of Africa and its influx of white immigrants escaping from a third-world Europe. Samuel R. Delany: One of the "Big Three" in afrofuturism (specifically he was one of the authors name-dropped in Dery's 1994 essay), famous for being one of the first major black science fiction writers to break into the mainstreamnote That we know of; given the prevalence of anonymous authors during the earlier eras of science-fiction it's quite possible some of said authors were black, or at least non-white. Works such as "Aye, and Gomorrah..." were groundbreaking in their time for their explorations of race and sexuality. Octavia Butler: Second of the "Big Three" mentioned in Dery's essay. Works like the Xenogenesis trilogy (which often feature black female protagonists) emphasize the importance of diversity and change in protecting and preserving the human race. Steven Barnes: Final member of the "Big Three". A frequent collaborator with Larry Niven, and writer on sci-fi shows such as Outer Limits and Stargate SG-1. N. K. Jemisin tends to get labelled as an Afrofuturist writer given that she writes science fiction and fantasy. She contests the label, however, finding it reductive and ill-defined. Most of Nnedi Okorafor's books take place in a technologically updated future or alternate universe Africa that is also a Magical Land. Some examples are Zahrah the Windseeker, The Shadow Speaker, and Who Fears Death. The novel Invisible Man (not to be mistaken for that other novel with a similar title) uses the power of Invisibility as a metaphor for living as a black person in America. Mumbo Jumbo: Alternate History novel (with elements of Urban Fantasy) set in The Roaring '20s about a millennia-old Ancient Conspiracy devoted to suppressing black history and culture. The Ear, the Eye and the Arm takes place in Zimbabwe, in the year 2194. In Otherland the Post-Cyberpunk applies to everywhere in the world, but notable is that Renie and !Xabbu are from Durban, South Africa. Jon Courtenay Grimwood's Ashraf Bey books are set in an alternate universe North Africa. The Watekni subculture in a 20 Minutes into the Future Kenya in Ian McDonald's Chaga. Zoo City is a Cyberpunk novel with fantasy elements set in South Africa. It has an endorsement from William Gibson himself and has the same kind of grey market protagonist that Gibson's novels favor. Alastair Reynolds's novel Blue Remembered Earth. While not everything is perfect in the African countries, they've become new economic and technological powers and the overall tone is quite optimistic. A Post-Cyberpunk sensibility is present, but it's mostly set dressing. Raphael Carter's The Fortunate Fall, a Post-Cyberpunk novel set in a 24th century where everywhere but Africa is a third-world crapsack. Africa, on the other hand, is the hypertechnological promised land where, in an inversion of the "one drop" rule, only those who prove via blood test to have African ancestry are allowed entry. And did we mention the possibly real/possibly cyber versions of the Egyptian gods? In Isaac Asimov's I, Robot universe, the Tropic Region (a unified Africa, South America, Latin America and Mexico) eventually becomes Earth's primary economic driver, while Europe sinks into a sleepy backwater that's more of a retirement community writ-large than anything else. Alien in a Small Town. Set in the 24th century, only a brief section near the end of the book is set in Zimbabwe, but we learn that Earth's capital city is located there, and it seems to be a generally good place to live. Tendai grew up here, and he shows his wife Indira the country's ancient stone cities, wildlife preserves, etc. Notably, there is a monument to all who died in the AIDS plague of our own time, and to those who died under "the vile 21st century tyrant Mugabe." Children Of Blood And Bone takes place in a future/alternate universe (it's not specified which) Nigeria in which there is a Ban on Magic, and much of those who practice magic (or maji) were murdered a decade before the book begins. The maji who were not killed are viewed as second class citizens and oppresed by the government. Much of the book parallels modern-day racism, with maji looking different to non-maji (being darker skinned with Mystical White Hair). The author, Tomi Adeyemi, states that she was explicitly inspired by modern instances of Police Brutality and institutionalized racism. Straight Outta Fangton by C.T. Phipps is the story of Peter Stone, a black vampire who is locked out of the riches and hedonism of the "Old Ones" of his kind by a combination of prejudice as well as classicism. Peter comments on the fact Fantastic Racism doesn't really correlate to a lot of his regular experiences as a black man in New Detroit, parodying the concept. He routinely deals with hate groups, Neo-Nazis, vampire hunters, and bill collectors in an Unmasqued World. The book Lovecraft Country by Matt Ruff is a story about a family of black Americans traveling to H. P. Lovecraft's Arkham, Massachusetts (or the city which inspired it in-universe). There, they are confronted by a mixture of racism and supernatural horror. Luke Cage takes a comic book setup (superpowered hero defends his hometown from evildoers) and uses it as a springboard for exploring police brutality, racial identity, and fighting white supremacy. Cloak & Dagger (2018) stars an interracial couple with Wonder Twin Powers - the black, upper-class Tyrone (Cloak) has darkness-based powers while the white homeless Tandy (Dagger) can shoot light-based projectiles. The South African/Canadian sci-fi series Charlie Jade involves three different universes in its storyline. One of them, the "Alphaverse", is dystopian and completely cyberpunk, including lots of rain. Its counterpoint is the ecotopian "Gammaverse" (unpolluted, but rife with political corruption and social engineering). The neutral one is the "Betaverse", which is our own early 21st century world. The whole series takes place in the Cape Town region and very little info about the rest of the world is ever given. According to the series's script, both the Alphaverse and Gammaverse are supposedly alternate histories of the Betaverse, with a divergence occuring shortly after WWII or during the early Cold War period. Star Trek, while not afro-futurist in and of itself, did have an influence on the genre due to the presence of Uhura; the fact that a black person had a place on a futuristic space ship left a serious impact on young viewers. I am a human being, dammit! You can deny me all you want, but you can't deny Ben Sisko - he exists! That future, that space station, all those people, they exist in here [pointing to his head], in my mind...You can pulp a story, but you cannot destroy an idea. Don't you understand? That's ancient knowledge. You cannot destroy an idea! That future, I created it and it's real! Don't you understand? It is REAL! It's REAL! In a similar vein to Luke Cage, Black Lightning centers on a black superhero who uses his powers to fight crime and institutionalized racism. Sun Ra is widely considered the Trope Codifier, with the way he combined alien and space motifs with African (especially Egyptian) imagery. Parliament Funkadelic uses crazy sci-fi costuming and imagery in their music and live shows. George Clinton, describing the inspiration for Mothership Connection: We had put black people in situations nobody ever thought they would be in, like the White House. I figured another place you wouldn't think black people would be was in outer space. I was a big fan of Star Trek, so we did a thing with a pimp sitting in a spaceship shaped like a Cadillac, and we did all these James Brown-type grooves, but with street talk and ghetto slang. Janelle Monáe uses futuristic and android imagery to discuss contemporary issues faced by the African-American community. I'm tired of Marvin asking me, "What's Going On?" Beyoncé incorporates Afrofuturist elements into her music videos and live performances, such as her robotic costuming in the music video and live performance of "Sweet Dreams" , and her cyborg hand in the "Single Ladies" video. Most notably Lemonade (2016) leans heavily into the "fantasy" side of Afrofuturism, using religious imagery inspired by Yoruba and Christianity as well as referencing famous African-American legends such as Igbo Landing . Boney M did this sometimes— "Nightflight to Venus" and the A-side of 10,000 Lightyears come to mind. The entire subgenre of Detroit techno is Afrofuturist. Drexciya combines sci-fi with aquatic themes. In Magic: The Gathering, the West Africa inspired Jamuraa was one of the most magically and technologically advanced societies of Dominaria, essentially making it Magic's Wakanda, though this is downplayed as the focus on the sets featuring it was on the fantasy rather than sci-fi aspects. To a lesser extent Amonkhet, which is based off Ancient Egypt with Stargate-ey aesthetics, but still features predominantly african humans and has a colonialist narrative. The Trinity roleplaying game subverts this; Africa is a leading force in 22nd century Earth, though not without its problems. It helps that Africa managed to avoid the worst damage of the Aberrant War, and the more modern Europe and North America got hit hard. Transhuman Space has a lot of preppy Post-Cyberpunk, but one of the biggest themes is that the degree of penetration is horribly uneven and the full benefits of the Fifth Wave of technological advancement are only available to the richest parts of the world. Africa is not one of the richest parts of the world, and it's straight cyberpunk if you're lucky. While Shadowrun is primarily focused on North America (especially Seattle), Africa receives no small amount of attention, with both the setting's worst Wretched Hive and its most advanced space port (and Space Elevator) being situated on the continent, along with several other places of note. Halo: New Mombasa, Kenya, is a high-tech city and spaceport. At least when Halo 2 begins, before there's lots of Stuff Blowing Up. The horrible nature of the place is brought up in audio logs found in Halo 3: ODST, where we learn about a young girl trying to save her scientist father during the attack, dealing with panicking looters, people generally Dying Like Animals, and the chief of police being a Dirty Cop and molester trying to make the worst of the situation. One of the campaigns of Empire Earth 2: The Art of Supremacy takes place during the "Synthetic Age" (202X-204X) (featuring things like nanotech enhanced soldiers and giant mecha) in Africa, and deals with the poor natives taking up arms against the exploitative megacorps. It ends with Kenya becoming a technologically advanced world superpower thanks to the deposits of otherwise unattainable elements there. Played with in Dreamfall: The Longest Journey and its sequel Dreamfall Chapters, which takes place in a Cyberpunk future where most of Africa has risen as one of the world's leading economic superpowers following several economic collapses and crises in Europe and America. As a result, most African countries are consistently portrayed and described as peaceful, idyllic, and prosperous; a stark contrast to the run-down and polluted, borderline dystropic Europe. The People's African Union is one of the factions colonizing space in Civilization: Beyond Earth. In-universe, it's said to have come about as part of a sub-Saharan renaissance, and has an AI focusing on the Harmony affinity and eschewing the Supremacy affinity. However, while they're likely to make and keep alliances and their faction bonus is a boost to food production, their leader is a stern Reasonable Authority Figure who, behind his jovial front, harbours a measure of resentment over how the the African people were exploited and humiliated by foreign powers in the past few centuries, and is determined to make sure that never happens again. A faction of Beware the Nice Ones, basically. Overwatch has the city of Numbani in the West-African savanna. It is a gorgeous, technologically advanced metropolis built after the Omnic Crisis and is one of the few places where humans and omnics live side by side in peace, working together to create a Utopian Africa. As a result, it is unofficially known as "The City of Harmony". Certain characters have special dialog on the location, ranging from admiring its peace to rage and disgust at the idea of tolerating omnics. League of Legends champion Ekko, the Boy Who Shattered Time has an Afrofuturist sensibility: A street-smart, anti-authoritarian black kid capable of manipulating time with his high-tech equipment. Some people interpet the Toejam and Earl games as a science fiction allegory to the african diaspora. Technobabylon takes place in the independent high-tech city of Newton. Based on some comments, it's implied that Newton is located in Kenya, not too far from Mombasa.